Today, the average person changes jobs ten to fifteen times with an average of 12 job changes over the course of their career. In fact, many people spend five years or less in each job. These numbers are rather staggering. But, in my opinion, it’s not necessarily how long you stay at a job, but more about staying in your industry —or in your lane. Your career isn’t going to happen in a minute. Just look at Mark Zuckerberg, Jeff Bezos, Marissa Mayer, or even Bill Gates. Do you think they became successes by changing lanes every 4 years? No. In fact, these guys have been building their success for decades. They found their lane. They weren’t afraid to pivot if there was a pothole, but they kept laser focused on the finish line. 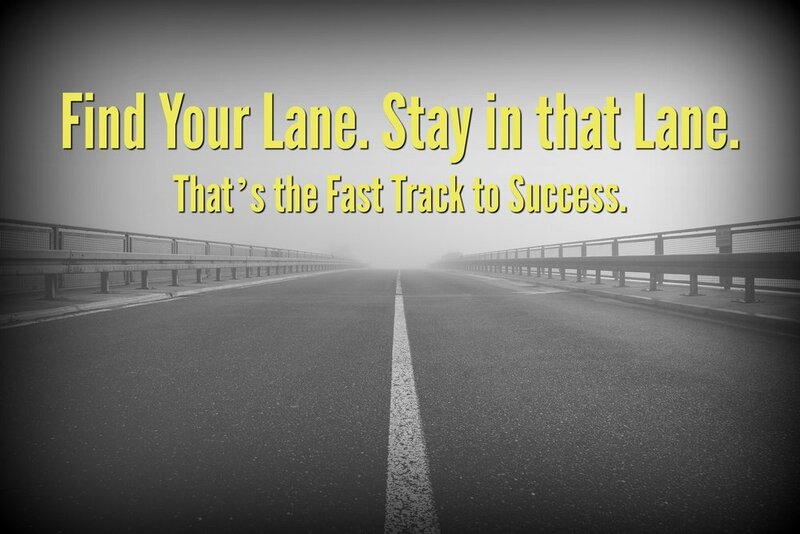 Whether you’re just starting out your career or are trying to get to that next echelon of success, here are a few of my tips for staying in your lane. It takes time for things to grow and manifest –just like your career. If you are truly trying to build a career, you need to stay in your industry long enough to create and innovate and make the right relationships that will impact your career. Everything takes time and if you continue to bounce in and out of your lane, you’re essentially starting over every time. You will never be able to truly grasp what your true mojo is. Being successful takes dedication, commitment and time. Realize that most successful careers are 20-year “overnight” successes. If you want to be one of those successes, it’s about finding your industry. Maybe you pivot, but you’re staying in your lane. Everyone is so used to instant gratification; not to say that’s a bad thing. However, in a career, that’s not what makes a success story come to life. Your strengths are what will translate into success, but you have to be willing to put in the time to perfect these skills. Regardless of what company you are at, you have the opportunity every single day you go into work to do more and to hone in on your strengths. It takes time to find out what you are good at and to improve upon the things you are not. Relationships are so important in fostering and building careers. You really need to believe that relationships are the fuel that help your company or business or career expand. And, if you’re not in your lane long enough to nurture the relationships, how can that manifest? I am not saying you should stay in a job or career path you hate just so you can say you’ve been doing that job for x amount of years. It’s more than okay to change jobs or career paths, but only if you have truly given the current one your all and have really tried to grow. It’s about really dedicating the time to find your mojo —the job that is going to fulfill you and make you happy to go to work in the morning. This doesn’t come from job hopping. This comes from focusing on the finish line, staying in your lane, not being afraid of potholes, and giving everything you do the time and dedication needed to feel confident you gave your best effort.